Three United Methodist pastors serving in Baton Rouge recently launched a cutting edge bible study and outreach initiative targeting young adults based in the capital city. Rooted Baton Rouge is the brainchild of Revs. 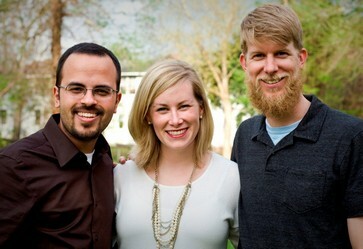 Katie McKay Simpson, 29, Drew Sutton, 30, and Juan Huertas, 33. Participants in the six-week Lenten Bible study recently met at a mixer organized by the three pastors and held at a downtown restaurant. This initial effort culminates in a “hands-on” mission event with and for inner city children on Saturday, March 24. Rooted Baton Rouge is using social media to promote and grow its efforts. A website (RootedBR.com) is used interactively within the study groups to determine what will be discussed weekly. Visitors to the site can view blog posts and find out information about meetings and events. These small group studies meet in a variety of locations in Baton Rouge and are led by lay volunteers. Revs. Huertas, McKay Simpson and Sutton visit the groups and offer guidance as the groups progress through the study, which follows the lectionary. “We are asking these young adults reflective questions. ‘What do you see in your neighborhoods? Where are the needs? How do you live out your faith in ways that are making a difference?” said Rev. Sutton, who serves as campus minister for the Wesley Foundation on LSU’s campus. Much like the small group meetings through Rooted Baton Rouge, John Wesley held class meetings to hold people accountable and find new leaders in the church, said Rev. McKay Simpson. “Rooted BR has a similar theory with the small groups. It's rooted deeply in Methodist history,” she said. This city-wide ministry is an attempt to collaborate and share strengths with other churches or ministries, said McKay Simpson. The group plans to resurrect Rooted Baton Rouge at various times of the year, and hopefully, encourage other denominations to join the ministry.